Beetroot is a dark red vegetable which is the taproot portion of the beet plant, usually known in North America as the beet, table beet, garden beet, red or golden beet etc. 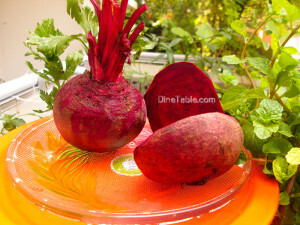 Betacyanin is the compound that gives beetroot its purplish-red colour and is also a powerful antioxidant. Most beetroot on sale is round and red but yellow, white and stripy versions are also available. Usually deep purple roots of beetroot are eaten either boiled, roasted or raw, either alone or combined with any salad vegetable. The green, leafy portion of the beet is also edible. It is most commonly served boiled or steamed. The beetroot taste is described as sweet, earthy and tender to eat. 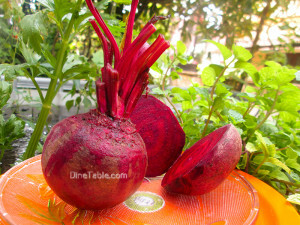 Beetroot is a good source of iron and folate. It also contains nitrates, betaine, magnesium and other antioxidants. These colorful root vegetable contain powerful nutrient compounds that helps to protect against heart disease, birth defects and certain cancers. Recent studies revealed that nitrate is the special ingredient in beetroot which lowers blood pressure and may help to fight against heart disease. Having just about 500 grams of beetroot reduces a person’s blood pressure in about six hours. It reduces blood pressure in hypertensive individuals and so may have an effect on mechanisms of cardiovascular disease. Many of the unique phytonutrients present in beets have been shown to function as anti-inflammatory compounds. Beetroot is rich in iron. Iron helps in the formation of Haemagglutinin, which is a part of the blood that helps to transport oxygen and nutrients to various parts of the body. Betacyanin, the pigment that gives beetroot its rich, purple-crimson colour is a powerful agent that suppress the development of some types of cancer such as Skin, Lung and Colon Cancer. Beetroot extract is also being studied for use in treating Pancreatic, Breast and Prostate Cancer. Beets are good for pregnant women since they are rich in vitamin B and folate which helps in the development of infant’s spinal column and helps to reduce birth defects. Researchers have found that drinking beetroot juice can improve oxygenation to the brain, slowing the progression of Dementia in older adults. Beetroot is packed with mineral silica, an important component for the body to use calcium efficiently. Since calcium makes up our bones and teeth, having a glass of beetroot juice a day could help to keep away conditions such as Osteoporosis and Brittle Bone Disease. The presence of beta-carotene, which is a form of vitamin A in beetroot helps to prevent age-related blindness called Cataract. People suffering from diabetes can fulfill their sweet craving by adding a little beetroot in their diet. Beets contain an antioxidant known as alpha-lipoic acid, which has been shown to lower glucose levels, increase insulin sensitivity and prevent oxidative stress-induced changes in patients with diabetes. The beta-carotene present in beetroot aids in reducing or slowing Macular Degeneration in the eyes, an incurable condition that blurs central vision. Beetroot helps to prevent constipation because of its high fiber content and also promote regularity for a healthy digestive tract. Beetroot juice supplementation has been shown to improve muscle oxygenation during exercise. Those who drank beet juice prior to exercise were able to exercise for up to 16 percent longer.